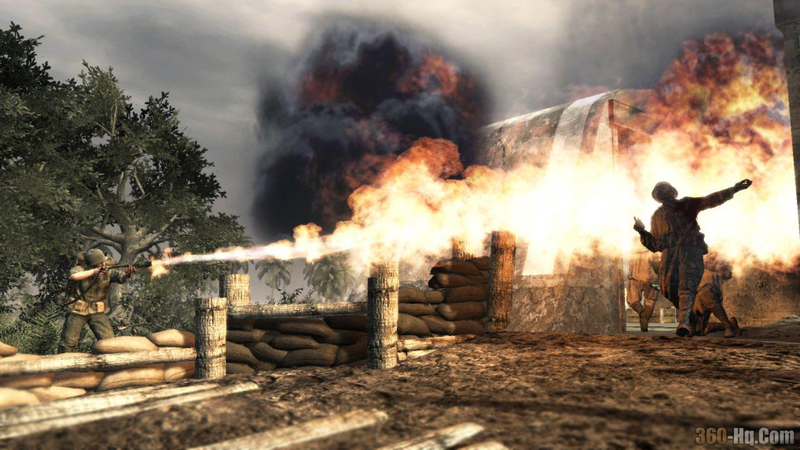 In just the last few days a flood of screen shots have poured out for Call of Duty 5: World at War and the screen shot content is real nice like the flame thrower pic below, looks like they just might be going for an ultra violent game here and that just might cause a censored version for the Wii. From what i have heard none of this stuff was supposed to go live until June 23. PCGames.de, the German Official Xbox Magazine and Videogameszone.de must not have got the memo on that one since 12 screen shots have made it out. To see all 12 screen shots check here before someone gets mad and pulls them. With that said i would also like to say that Microsoft said that the first movie of Call of Duty: World at War will be on XBLM June 21-22.